Stop press – newspaper readers can get their daily fix of stories from home and abroad for free thanks to a new online initiative. All the day’s news, features and sport from the likes of The Daily Telegraph, Daily Mail and Guardian are available in full colour in an exact replica of the print edition*. And anyone wanting to get the latest from around the world can take a look at papers in places such as America, Australia and even Azerbaijan. There are also a raft of regional newspapers, with reports from Yorkshire to Kent and London to Scarborough. 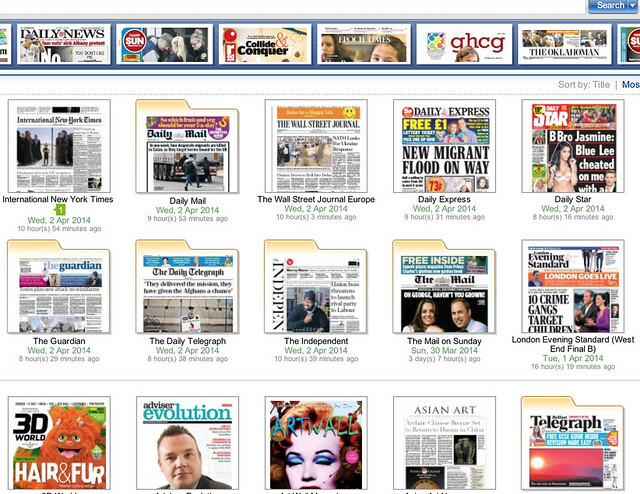 The digital newstand, featuring 2,000 papers from 60 countries around the world including hundreds of UK publications, has been set up by Surrey County Council’s libraries service. Anyone with a library card can log in and view stories on a computer, tablet or smartphone. It comes after the launch of an app that allows readers to find and reserve a book simply by scanning its barcode and a virtual version of a library that lets people experience being in the branch from anywhere with an internet connection. Helyn Clack, Surrey County Council’s Cabinet Member for Community Services, said: “Whether you want to catch up with the national headlines, check the local sports news or get the latest global business updates, our free online newstand makes it easy. Readers flick the pages of the paper just as they do with a print copy and jump into stories by clicking the headline. They also get the option of sharing reports via email, Facebook and Twitter and listening to them being read. Recent past issues are available and stories written in other languages can be translated into English. * Those behind a paywall are not available.